Meanwhile our President is fighting the last war trying to build a concrete wall in the middle of the river dividing the US and Mexico when he should be building a cyber defense of our financial and communications networks our communications and power grids and our voting infrastructure. Why are the Republicans enabling this stupidity? Because without the wall and / or significant border security measures, the rest of the issues will not matter. Why can’t Dems see the need for border security? BTW why can’t we accomplish all of the necessary protection initiatives? Because like everything the republicans champion, the facts show their stance is completely absurd and a waste of money that could go to other places. $50-500 billion for a total wild goose-chase that won’t affect anything. They will happily clap and stand by when he assigns the highest security roles in the country to someone with zero experience however and forces clearance to his daughter and her husband. The president is quite capable of doing both, provided that he receives the go-ahead for funding them both. Why do you consider both items on an either/or basis, or were just being another unthinking Trump-basher? Donald Trump regularly incites political violence and is a serial liar, rampant xenophobe, racist, and misogynist. The sooner that dirtbag is run out of office — the better. President Cheeto isnt capable of anything but self promotion and exploitation, why oh why would you ever think he was capable of both creating a wall and cybersecurity at the same time? The guy cant even barely read, let alone make sound national security decisions. “cant even barely read” – the irony burns. j w Why Did You Start This? You just haaaaad to bring politics in this didn’t you… ? Jeez! The jerks are turning Krebs into a hate site. Trump derangement at it’s finest. Never miss an opportunity to bash the President and ignore the members of your own party that all talked up border security until they didn’t. Some of us have attention spans longer than a goldfish. PS: How is the government going to fix an issue like this? Unless you are advocating for a complete government takeover of the Internet and national communications, it’s not going to happen. But you probably like that idea, don’t you? Trump Derangement Syndrome is believing that the “truth is not the truth”. Trump Derangement Syndrome is believing that “what you’re seeing and hearing is not what’s happening”. Trump Derangement Syndrome is believing that our president is strong as he kneels and licks the boots of Putin, MBS, and any other actual dictator. That’s right… he likes Putin sooooo much that he pulled out of the INF and is working with the EU to tighten sanctions on Russia after the Ukrainian sailors were picked up. What was that you were saying about believing what you are seeing and hearing is not happening? You should probably go back to saving the polar bears from your parent’s basement. Mr. krebs your Articcles getting less and less interesting. so boring I was Trying to read this one Here but nothing really I Can’t even undestood where is the crime is Here?? and how do the criminals make profit?? I hereby release you to go find more interesting articles somewhere else. Bye now. A wall won’t stop phishing mails. And we don’t even know which side of the border they originate from. I have other question, Mr. krebs where Will You live IF You not live in USA? what Will you do if USA Will be falling into communism? this capitalism regime Will not last long Trump Will devalue USA dollar… like soviet union. Well, if I was an American citizen (which thankfully I am not), I’d be thinking seriously of moving to a civilised country such as Canada or New Zealand. Australia (where I live) isn’t all that bad either, but we too have had an idiotic government for years. If these phishers ever hire someone proficient in the English language, we’re all doomed. You mean you don’t address high banking functionaries you’ve never personally met as “dear”? This comment section was a lot more useful before everyone started filling it with their political opinions. You are liberal russian bot! typical end-user “I got an email with an attachment and a link from someone who’s _______ so I opened it!” fill in the blank with any handy name (known to me, a stranger, a celebrity, whatever, the name hardly matters. Sad commentary on our education system and parenting today that we’re raising and teaching stupidity. Back on topic: Coincidentally on Sunday 2/10 there was an apparent ATM skimming operation at my Credit Union in East TN with maximum per-day W/D’s of $800 that appear to be ATM W/Ds. Seems odd there are numerous and multiple skimmers at dozens of ATMs all at the same time. I alone have three friends who were hit all at different ATMs. Perhaps this is part of the phishing campaign and a backdoor network hack made to look like skimmers and masquerading as ATM W/Ds? As silly as the scam seems, there are some that would fall for it. I like getting these and I will share them with my staff. I’d much rather share something that appears to be obvious than not share it and have someone fall for it just so I could say – yes, I saw it but didn’t think anyone would fall for it. Thanks KoS! People love my wall. It’s gonna be a beautiful wall. People love my wall and they love me. It’s going to be a beautiful wall. Wow… amazing how politics pops up on this article. Some how people wonder why the security field is suffering for talent and trend setters. This is why, we have individuals such as yourselves giving a horrible name to the profession with your stupid and blind rage. You are exactly what is wrong with society today. Hopefully, Krebs can rid this site of these toxic people so we can get back to the content of what truly matters on this site. It suffers for many reasons, including all the jobs only existing in high cost urban areas, restrictive dress codes, extremely high requirement for continued education, and at least around here fairly low pay. In my experience few companies actually value their IT security staff and few make any real efforts or budget towards it until after an event, and even then it is barely more than the minimal amount for a couple years then back to complacency. This attitude pervades every industry and government branch and goes all the way to the top. I am sure they could used linkedin as well to find the BSA Officers then guess the email address. Presumably the numbers and URL vary by credit union. Interra is a real credit union, but not a Federal Credit Union. Only a knucklehead would open that pdf and then click on that link. YAMMV. The PDF that I got (thanks Mila!) was for the Credit Union called Interra. It was sent to OCWEN which is a mortgage originator. My guess is that the criminals created custom domains and PDFs for each campaign. Do you honestly not see that this is just another attempt by Cheetos Jesus to line his pockets with more of the taxpayer’s money? Very interesting article, Mr. Krebs. 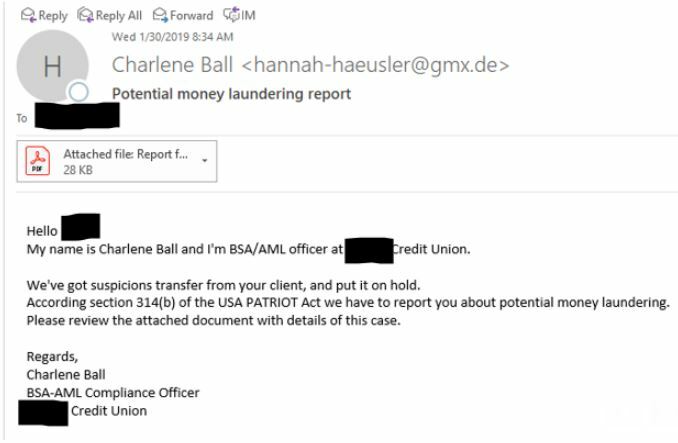 I forwarded the link of your article to my daughter, who is lead of the KYC team (Know your Customer- AML related) at a major international bank. I do wish all comments would be professional and on subject.